In order to improve the Coordinated Access Network, Rapid Rehousing, and Shelter Diversion efforts, we must strengthen the front lines of the fight against homelessness and reorganize, re-prioritize, and re-connect to strengthen efforts across the board. 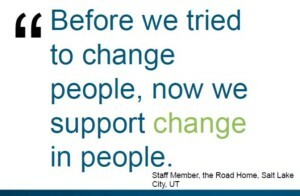 To do so, we encourage direct services across Connecticut to practice the Housing First Approach, a practical and philosophical shift which prioritizes rapid rehousing and encourages housing before further services. 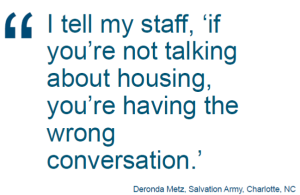 The main message of Housing First is to shift conversation between clients & emergency shelters from “What can we do to help you?” to “what can we do to get you housed?” This is based on the belief that all other social services can be implemented afterwards and more effectively once the individual or family is in housing. The belief is that everyone is always ready to be housed, regardless of their behavior or additional complications. Housing First encourages shelters and service centers to treat homelessness as first and foremost a housing problem rather than an issue of mental illness, poverty, joblessness, or disability. Therefore, everyone is always ready to be housed and clients should be connected to permanent housing resources first, and all other services should be voluntary and used to sustain housing. For example, there are around 326,000 identified individuals with substance abuse problems in Connecticut alone, why do the approximately 410 substance abusers who are also homeless deserve housing less than the substance abusers who are already housed? Why do they lose that right to be in shelter? Why do we treat them with less dignity than the substance abusers with housing? Do the housed abusers have to undergo drug tests to maintain their housing? Learn more about Housing First and other Best Practices in Emergency Shelters and Crisis Systems below. An October 2018 webinar presented by CCEH and NAEH for CT providers.